We see it over and over again. Patients visit us who are in pain. Maybe they haven’t slept well for days. They can’t focus on work or their families, because of that aching tooth! Sometimes, their cheeks are swollen like a chipmunk’s! But, when they leave us, they are feeling and looking more like themselves, with relief from pain, thanks to the procedure the media would have them believe is something to fear: root canal therapy. This common dental procedure is (unfairly) associated with pain. 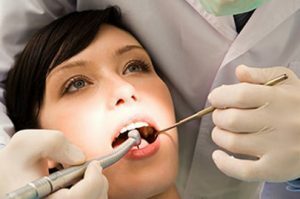 Root canal treatment doesn’t cause pain; it’s used to resolve deep infections whose symptoms may include severe, throbbing toothaches and sensitivity that gets worse when you bite down, or drink something hot or cold. The reputation is also rooted in other dentists’ approaches. In Dolton, root canal treatment lives up to the Pleasant Dental name. We won’t go digging around in an infected tooth. When the infection gets to this point, it can be tough to get the tooth adequately numb. If your mouth isn’t fully numb, you will feel something, and it won’t be pleasant. Ouch! We avoid the ouch by resolving the infection first – with antibiotics. These infection-fighters help to manage biting discomfort before root canal therapy, for a comfortable procedure. In fact, the most common thing we hear from patients is how bored they are! Yes, we frequently have patients nod off during root canal treatment. Antibiotics aren’t a cure-all, though. The only way we can truly treat an infection that has infiltrated the root canal –that inner part of the tooth – is by manually removing infected tissue. And the way we do that is with the root canal procedure. Root canal treatments may also be the only way to save teeth that are very decayed, have been on the receiving end of many procedures through the years, are covered with a faulty or worn crown, or have big cracks and chips. Even though your tooth may not look chipped or cracked, that doesn’t mean an injury hasn’t caused damage to the inner pulp tissue. Any time the pulp is inflamed or infected, you are likely to need to do something about it! This damage often doesn’t resolve on its own. Symptoms get progressively worse. While no procedure has a 100 percent success rate, many teeth can be saved. There is no tooth replacement as good as your own tooth. The more natural tooth structure retained, the better. These “conservative” approaches best mimic natural look, feel, and function. You’re able to chew efficiently, enjoy normal biting sensations, and a healthy tooth helps other teeth. It keeps its neighbors from having to carry more of the workload than they’re designed to carry, avoiding excessive wear and strain. After the inside of the tooth is cleaned, it’s sealed, and usually, a temporary crown is placed. You’ll wear the temporary crown while our lab makes your permanent one. An interim crown helps to protect the tooth, but it’s not designed to withstand the same forces as your permanent crown. Be gentle! You only have to wear it for a couple of weeks while we wait for the permanent new tooth. Think of the treated tooth as any other tooth. Once the new crown is placed, keep up with the usual maintenance – home care, and professional cleanings and exams typically at six-month intervals. You may require more frequent visits, depending on your health and dental needs. Aside from frequently hearing, “I can’t believe how easy this was!” our patients often tell us about the value they got from root canal treatment at our office. We don’t nickel and dime. Our procedures are designed to get it right the first time. Our prices are competitive, without scrimping on materials, technologies, and techniques, or cutting corners where it matters most. Do you fear the bill more than the treatment itself? We welcome questions about payment and offer many different options for out-of-pocket costs (often insurance companies cover 80 to 90 percent of root canal treatment). Call (708) 576-1900.